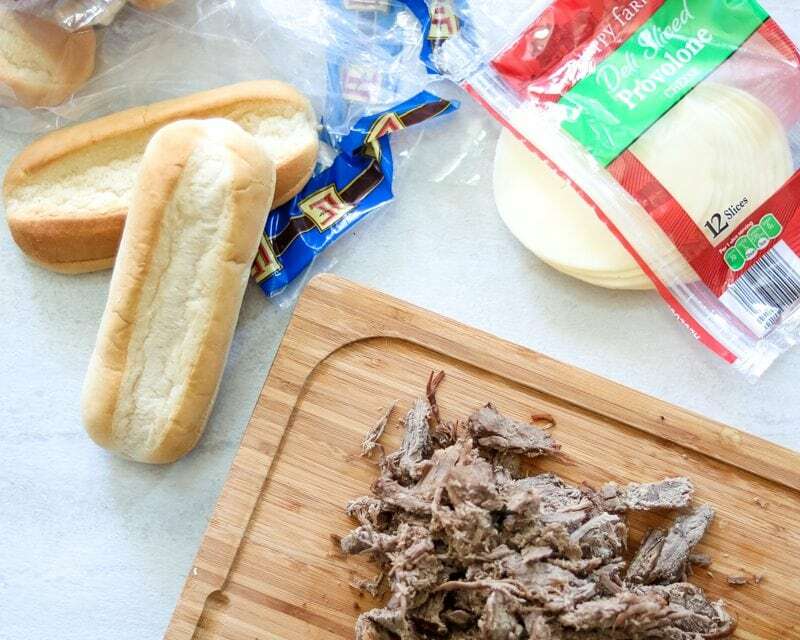 These Easy Instant Pot French Dip Sandwiches are sure to become a new family favorite dinner. Tender chuck roast is piled on a toasted garlic bun and smothered with provolone cheese. 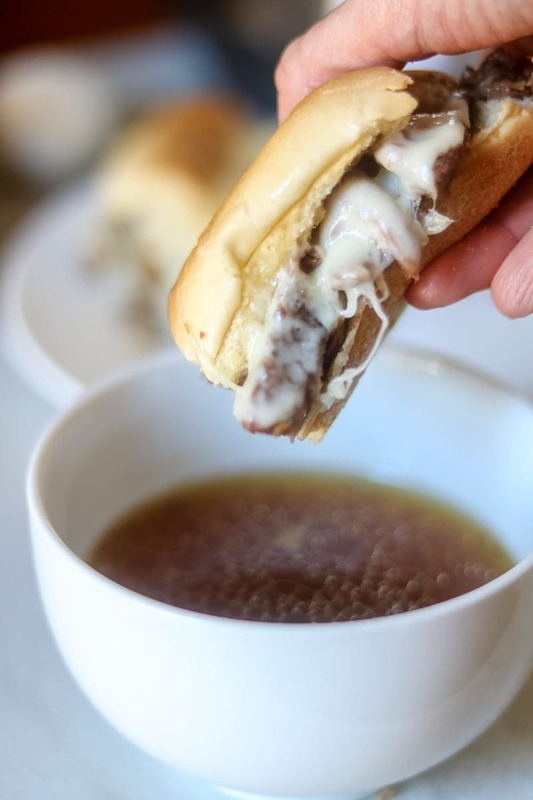 Served up with rich broth on the side for dipping, these delicious French Dip sandwiches are made with almost no effort in the pressure cooker. For more delicious Instant Pot Beef Recipes, check out Instant Pot Beef Stew, Instant Pot Pot Roast, and Instant Pot Meatballs. Or look browse through all my Instant Pot Recipes. Want to know what makes my heart swell? New babies, snuggles with my kids, seeing kindness from a stranger, and sitting down to a dinner that my entire family raves about! I enjoy that dinner even more when it takes me a mere minutes to prep. An extra bonus is when I can make the meal on a budget. I am about to make YOUR heart swell with my latest recipe, Instant Pot French Dip Sandwiches. Want to know how much my family loved Easy French Dip Sandwiches? They were devoured by my entire family and my husband and son even said they would be happy if they ate these sandwiches a couple times every week. Now that is what I call a winning dinner! But what is not to love? 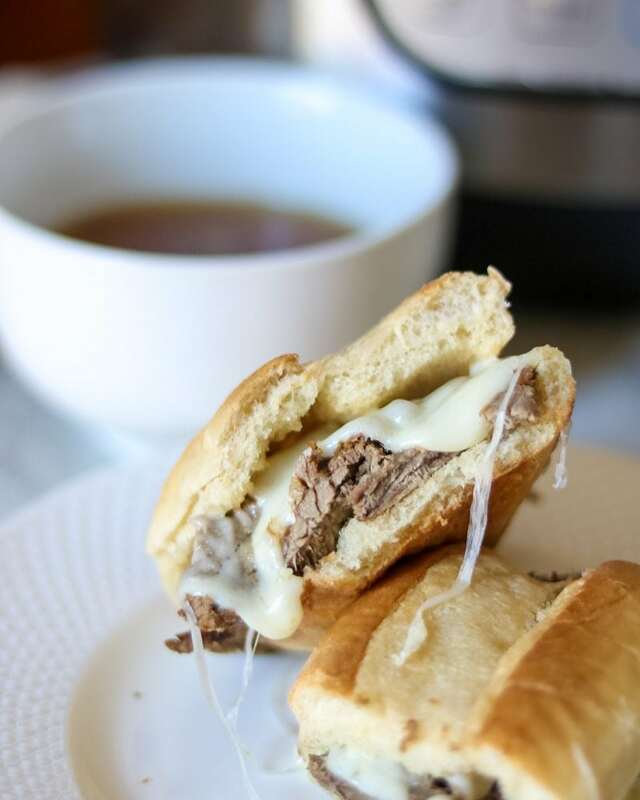 These Instant Pot French Dip Sandwiches have a garlic toasted bun, ooey cheese, tender beef, and flavorful aus-jus. Turn the pressure cooker to Sauté and allow to heat. Season the roast aggressively with salt and pepper. Once heated (the electric pressure cooker should read “hot”), add a bit of oil and sear the roast on all sides until golden. Add the beef broth, sliced onions, garlic cloves and soy sauce to the pressure cooker. Scrape up any browned bits off the bottom of your pressure cooker–do not skip this step! Place lid on the pressure cooker and turn valve to sealed. Set to high pressure for 60 minutes. You can cook your meat for 40 minutes on high in the pressure cooker. The roast will not be fall-apart-tender, but will instead be able to be sliced into thin strips for serving. I personally prefer my roast to be falling apart, but the choice is yours! Allow at least 15 minutes of natural release before finish releasing pressure and remove roast from pressure cooker. Remove roast from pressure cooker and place in large bowl or cutting board. Brush buns with melted butter (or olive oil) and toast in oven until golden. This keeps the sandwiches from getting soggy. Top buns with shredded beef and sliced provolone cheese and return to oven briefly to melt cheese. Serve immediately with a bowl of aus jus on the side for the perfect accompaniment to these pot roast sandwiches. If you don’t have an pressure cooker, you can still enjoy Easy French Dip Sandwiches, with the help of a slow cooker. Sear the meat in a heavy bottomed skillet in 1 tablespoon oil. Once seared on all sides, place the roast into the slow cooker with the broth, garlic, onion and soy sauce. Don’t be tempted to omit the soy sauce from these French Dip Sandwiches, that extra flavor adds just the right umami flavor. Instead of rubbing the toasted bread with a garlic clove, you can still impart garlic flavor by adding 1/2 teaspoon garlic powder to the melted butter or olive oil before brushing on the sandwich rolls. While optional to brush the bread with garlic butter, I would not skip toasting the buns for a French Dip Sandwich–it helps the bread from getting soggy. I prefer provolone cheese with French Dip Sandwiches, but Swiss can be substituted. My husband recommends after toasting the buns, spreading mayonnaise on the buns as well. I personally omit the mayo, but again, the choice is yours. Allow meat and aus jus to cool. Place together in freezer-safe container and freeze for up to 2 months. **By freezing the meat with the aus jus, you keep the bottom roast from drying out. Allow to defrost in fridge overnight and then reheat on stove until just warmed through. You can also add all thawed ingredients to the Instant Pot and cook for 3 minutes on high pressure. Use a slotted spoon to remove meat for sandwiches and serve strained aus jus on the side. Easy Instant Pot French Dip Sandwiches are sure to become a new family favorite dinner. Tender chuck roast is piled on a toasted garlic bun and smothered with provolone cheese. Served up with rich broth on the side for dipping. These delicious sandwiches are made with almost no effort in the pressure cooker or slow cooker. Season meat on all sides with salt and pepper. Turn Pressure Cooker to Saute and let heat to hot. Add oil and sear meat on all sides until golden (about 2-3 minutes per side). Add beef broth, 2 garlic cloves, onion slice and soy sauce to pressure cooker. Place lid on Instant Pot and turn to sealed. Cook on high pressure for 60 minutes for extremely tender meat or 40 minutes for meat that can be sliced. Once cooking time is finished, allow pressure cooker to naturally release for 15-20 minutes before manually releasing pressure. Remove meat and shred with 2 forks or thinly slice. Heat oven to 400 degrees and brush hoagie rolls with melted butter or oil. Toast rolls for 5 minutes or until golden and rub garlic clove over inside of roll. Layer meat and cheese on rolls and return to oven until cheese melts--about 3 minutes. Serve with side of strained aus jus (cooking liquid) on side for dipping. Total pressure cooker time: 5 minutes prep, 15 minutes warm up, 60 minutes cook time, 20 minutes natural release: Total time 2 hours and 20 minutes. If your roast is thicker than my pictures show, increase time by 15 minutes per pound. If the meat is still not tender enough for you, remove from broth, slice and put back in pressure cooker in broth. Set on high pressure for 10 minutes and allow to release for 20. Serve with slotted spoon. Slow Cooker Instructions: Sear the meat in a heavy bottomed skillet in 1 tablespoon oil. 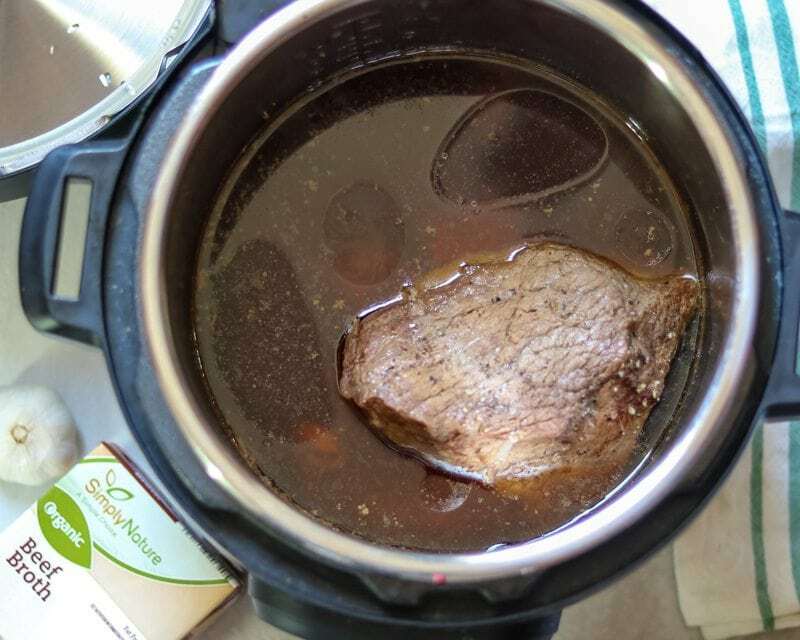 Once seared on all sides, place the chuck roast into the slow cooker with the broth, garlic, onion and soy sauce and cook on high for 6-7 hours or low for 9-10 hours. Nutrition Facts are based on 1/3 pound meat, 1 rolls, 2 slices of cheese and 1 cup aus jus. I haven’t made a french dip in years — but I desperately want to dive into that sandwich. Love that you can do it in the pressure cooker! I’ve never heard of these – they look so tasty though – I love beef cooked like this. Oh Angela, you have been missing out. You must try these! We love French dip sandwiches! I always buy healthy deli meat but this looks super easy and delicious. I’ll have to try this method instead! Yum! Such a great use of the pressure/slow cooker. I have actually never had a French dip sandwich before. Definitely need to start with this. You certainly need to give it a try! I read somewhere that bottom round is too lean for cooking in the IP! I am glad you proved this wrong as it’s one of my preferred cuts for this type of meal 🙂 I can’t wait to make this! I did exactly what your recipe said to do and mine wasn’t tender or falling apart. It was a tough mess. I even made sure i bought the correct meet “bottom round, Black Angus”. I so wanted this to work out. Oh well, thank you for the recipe though. Jodi, this makes me so sad for you! Can I ask a few questions? Were you sure to set on high pressure? Did you allow the pressure cooker to release naturally for at least 15 minutes?? That is crucial for tender meat (sort of like how you would let meat rest before cutting to keep it juicy) And what size roast did you use? Don’t discard the meat, place it back in IP and set again for another 20 minutes and let naturally release for another 20 minutes. It should be super tender after that. I had the same experience as the person above. Followed your directions exactly & it was tough. You may want to edit your instructions & include the put back in for additional 20min. Oh man, so sorry. I am remaking this today (for 5th time) to see if I can help troubleshoot better for you! Sadly, same experience here. 3.5 lb bottom round on high pressure for 60 minutes, natural release 15+ minutes — the meat was tough and thermometer read near 200! (160 is considered well done) I’m glad to report that the flavor of the au jus and prep of buns and cheese made for a delicious meal regardless! I’m hoping to figure out what we can change to get a tender falling apart result. Hi Jess! I am glad you were still able to enjoy dinner, but sorry your meat was not as tender. I state in post (under ingredients) that chuck roasts are the more tender cut. Bottom Round Roasts work perfectly but don’t shred (or fall apart) as easily. In the future if your meat is not tender after cooking, take the meat out and slice and put back in the pressure cooker for another 10 minutes in the aus jus–it will help it become a bit more tender (and cooking beyond 160 is okay in this instance) Hope those tips help! I live near a restaurant that’s known for their French Dip sandwiches and there’s always a line. I can’t wait to try this easy French Dip recipe so I don’t have to wait in line! I wanted to slice my meat and after 40 minutes on high it was very raw. I’m looking at your pictures and the size of my roast is nowhere close to yours but was a 4.2 lb roast. What size roasts have you used? I want to make this work for next time? So I tried this recipe for the 4th time to ensure directions were correct, as another person had issues with timing. My roast is 3 1/2 pounds, as stated on recipe card. For an almost 4.5 lb roast, I would cook for 15 minutes longer on high pressure. Also, be sure that your roast is completely thawed out, or you would need to add an additional 25 minutes to cooking time. I made these tonight and they turned out perfect, thanks for sharing the recipe!! Love that you enjoyed them Amy! This might be a silly question but can I use a top round instead? My grocery store did not have bottom round. I am attempting it tonight! Oh yay! Yes Steph, you certainly can. If after the 60 minutes the roast is not tender, cut it up and put back in pressure cooker for an additional 15 minutes on high. Enjoy! I read this recipe the other day and knew I had to head to Aldi for the ingredients. As a rule, I do not care for their meats, but I buy a good bit of their other products. Tonight I made this exactly the way you suggested. It was fantastic and I will definitely be making it again. I told my husband, the broth could be French Onion soup. The only thing was NOT Aldi was the rolls because, due to the storms in the east, the shelves were pretty bare and there were no rolls. I had to go elsewhere for them. I am loving your site. I have made the creme brûlée three times already. Oh Diane, this just made my night! I am so glad you have found my site and are loving my recipes. Stay safe and hopefully spring weather is on it’s way to stay. The best way to prepare shredded meat is always in a pressure cooker. I tried the recipe in the exact same way as you suggested but served it in between burger buns instead of rolls and it looked great and tasted just as great! How much time do you think it would take for a rosy half this size? Hi Kat! So sorry it took me a day to get back to you–we were traveling yesterday. You can use the guideline for 20 minutes per pound for cooking roast in your pressure cooker. For this particular recipe, I may go more like 25 minutes per pound, as you want the roast to fall apart. Enjoy Kat! This was absolutely fantastic. Thank you for sharing! I followed the recipe and made in instant pot. There was a ton of liquid, so next time I may try cutting the liquid in half. I am SO glad you enjoyed Andrea! This recipe does make a lot of liquid, but we love the Aus-Jus in GENEROUS amounts. However, with the leftovers–use it to make Instant Pot Beef and Barley Soup–Delicious! Omg,I just made this tonight for my family. So yummy! Even my hard to please father enjoyed it. YAY!! I am so glad you and your family enjoyed this meal! Have you ever made this with a frozen roast before, and if so what would you recommend for cooking time? Just fixed this for lunch…it was delicious. My husband repeatedly told me I could fix this dish again. Thank you for a great recipe! It was clear and easy to follow and resulted in a delicious lunch ncl as well as a ton of leftovers. Oh thanks for sharing Jeanette! My husband asks for this meal over and over himself. Can you use top round London broil for this? If so, how long would I cook a 2 lb. piece of meat? I made this tonight with a frozen chuck roast using your recipe plus the cooking time from your recipe with a frozen roast in the IP. At 90 minutes with a natural release, my 3 lb chuck roast came out perfect! This was fantastic! I tried to follow the recipe exactly as written, but my hubby insisted on searing the meat in a cast iron skillet – he layered and rubbed in sea salt, garlic powder and pepper. Also, I didn’t have provolone cheese, so I subbed with mozzarella. I WILL be making this again! I am so glad your husband and you enjoyed! The extra step of searing meat is always a good idea if time persists too–good call there.